Synonymous with comfort and style, Rainbow flip flops are summertime's go-to shoe for beachgoers everywhere. Not only do they protect your feet, they also protect our beaches! How's that for multitasking footwear? No, we're not talking about multicolored sandals so bright they force you to wear sunglasses just to put them on. Rainbow Sandals is the brand founded by Jay R. Longley, Jr. over 35 years ago. The idea to create a sturdy, smart sandal came to him one day as he strolled along the beach, enjoying the scenery and taking in the sights, sounds and…sandals. Yes, the beach was littered with broken sandals. Not an uncommon sight on a public beach, broken sandals often end up as refugees on the sand. While it's unpleasant because it slightly denigrates the beach's beauty, it's more frustrating for the wearer who realizes that his shoes are of such poor quality that they cannot even stand up to the task of walking around on a beach or boardwalk. This thought struck Longley, who decided then and there, on that sunny day at the littered beach, that he would create a smarter, sturdier sandal that would stand the test of time - or at the very least withstand a trip to the beach. Constant reconstructions and redesigns later, Longley had what he considered the perfect shoe that met his goal: the Rainbow Sandal. Flip flops are prime gear during the summer. Take a walk around the mall, peek at your fellow moviegoers' shoes, browse the aisles at shoe stores, department stores and even grocery stores, and you're likely to find flip flops galore. These shoes may not offer the most support in the world, but their versatility and general level of comfort makes them a favorite of many during the warmest months of the year. 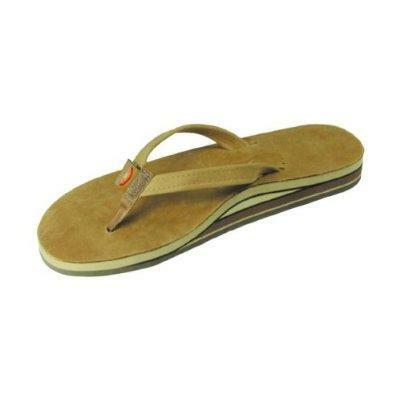 Rainbow Sandals offers a vast selection of flip flops that appeal to people of all ages. You'll find shoes for men, women and children in a wide variety of styles and constructed from various materials. No matter what your flip flop preference may be, chances are you'll find just what you're looking for in the Rainbow Sandals collection. Rainbow Leathers: These classic sandals are special for a few reasons! They're available in basic sizes and go all the way up to XXXL, they boast a sturdy, non-slip sole and they're made of thick, smooth grain leather. This is the pair to choose if you're searching for something comfortable, basic and timeless. Hemp: For the earth-friendly man, there's the Hemp collection. Constructed of 100 percent natural hemp fiber and offered with either single or double layer arch support, these shoes epitomize understated beachwear. Ladies have nothing to worry about when it comes to finding everything from low-key to glamorous flip flops. Rainbow Sandals has them all, whether you're after something simple to wear with your bathing suit or something just a touch livelier to slip on for a casual beach date. Color Crystals: Just the words color and crystal suggest great things, don't they? The company's glamorized shoes are made of leather and topped with a smattering of gleaming Swarovski crystals. Choose from a selection of colors. Wedges: If the reason you avoid wearing flip flops is because they don't offer you the same height your heels do, you can finally rest easy. The Wedge collection consists of flip flops with your choice of four or six layer soles. The straps are thick and textured to provide your feet with more support as you walk. Kids are happy running around in almost any pair of sneakers or flip flops, but it's always wise to choose shoes that offer the greatest degree of protection. These styles are comfortable and feature non-skip soles. Kids' shoes are available in leather, cape (which feature suede straps and "memory" molded tops) and crystal. You'll find Rainbow flip flops online at the company's official website and at Amazon.